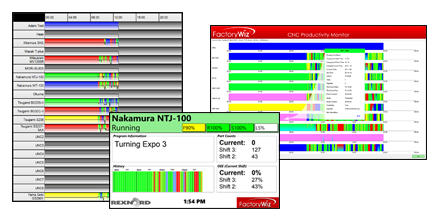 FactoryWiz Monitoring is a powerful, modern CNC machine tool and non-CNC asset monitoring and data collection system. 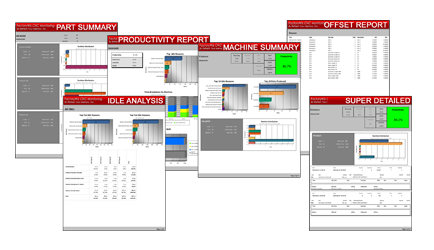 FactoryWiz Monitoring is a complete on-premise intranet solution which provides software to drive all large screen dashboards, automatically e-mail historical reports with real-time status of manufacturing assets and process. 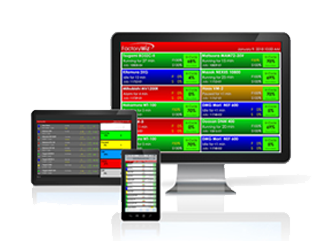 FactoryWiz Monitoring is NOT a cloud based system. It resides on-site where you have complete control of your data. Live and historical data can be viewed from anywhere in the world on ANY web enabled device: PC’s, tablets, and smart phones. Equiped with an open architechture API this flexible, scalable system provides complete access to all fields for customers as well as data exchange/integration with other ERP manufacturing systems. FactoryWiz Monitoring prides itself on being MTConnect compliant as well as having the most native Ethernet and Serial monitoring protocols in our market space. The majority of CNC Controls for the past 10 years have been fitted with CAT5 Ethernet and built-in data collection protocols which have never been utilized. The robust native protocols combined with MTConnect provide live productivity status and process changes such as Machine Status, Alarm Number/Message, Current Program Number/Program Name, Progress bar with % of Current Program completed, Feed, Speed and Spindle Load Override Dials, Active Tool, Duration of Current Status, Job and Batch Number along with Idle Reasons easily input by the operator using large buttons on a touch-screen display. Legacy CNC and non-CNC equipment can also be connected and monitored using off-the-shelf hardware such as Advantech ADAM (Data Acquisition Module) PLCs and MOXA-style Ethernet-to-RS232 components. When combined with the included State-of-the-Art FactoryWiz DNC software, the combination of ADAM and MOXA hardware can provide nearly the same monitoring information as a modern Ethernet equipped CNC control. FactoryWiz Monitoring Systems are provided as completely turn-key including on-site engineering for installation/training and hardware. A unique option is that any hardware may be sourced directly by the end-user. Industry 4.0 (IoT) provides complete shop floor visibility through full machine/event monitoring and managed file transfers on your plant-wide network. 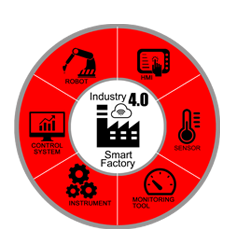 It’s what many call the “Smart Factory”, where computer software systems like FactoryWiz monitor physical processes such as CNC machines, robots or assembly lines and present real-time information allowing management to make better decisions based on facts. This information is shared with all consumers on the network, including ERP and MRP systems. Visualize all your critical machine data in real time via interactive charts, graphs, e-mails and texts from any web-enabled mobile device or PC in the world. All data is stored locally at your facility giving you full control of collected records. Front line managers receive the insight they need to streamline their work and improve operations, while giving executives real-time visibility and reporting the metrics they desire. 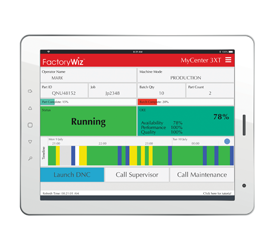 FactoryWiz Monitoring has a number of helpful pre-defined reports to track your productivity. Compare based on machine, department, shift, or part produced. If you would like to analyze the data a different way, all reports are end-user customizable using Crystal Reports – or we can customize reports for you. Additionally you will find reports breaking down common idle reasons, alarm messages, and changes to tool and work piece offsets with old and new values and a timestamp of any changes. Configure your system to automatically email you a particular report every day, week, or month. A concise 24-hour snapshot of what one or all machines have been doing over a 24-hour period. The color-coded graph shows when a machine was running or idle, while superimposed lines show the position of override dials at that time. Quickly see if a machine was running for three hours while the feed override was at 10%, or if a set of machines all goes idle at the same time of day. It can be time consuming to keep track of machine runtimes for maintenance purposes, so many machine shops give up and perform the same maintenance on every machine, month after month, regardless of actual utilization. 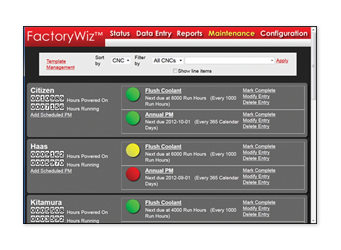 FactoryWiz Monitoring can simplify wear-based PM by keeping track of run-time and power-on-time for you and sending automatic notifications when a machine is due for PM. Operator-performed PM will generate a prompt on their tablet display while more complex maintenance notifications will be emailed to your maintenance supervisor. Flag the entry as recurring and the system will reset the notification automatically after each instance is performed. When it comes to productivity data, visibility matters. 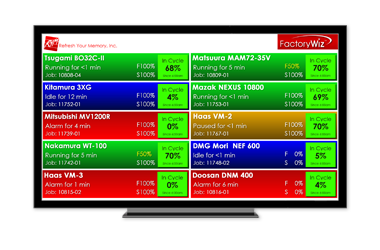 FactoryWiz Monitoring is capable of driving large format TV’s and monitors mounted in your machine shop or in office areas. Utilize common overview displays or segment displays by individual department or cell. In most cases, having information visible in a common area will have an immediate positive effect on productivity as information about how long machines have been down and why gets utilized by operators and management alike. Additionally, because FactoryWiz Monitoring signage is customizable it can be used to highlight standardization issues for closer scrutiny. If changes to speeds and feeds need to be made, make sure that information is getting back to programming by highlighting on the board when manual overrides are performed. Additionally, utilize our displays to improve communication between departments. When a machine is waiting for tooling or a quality assurance inspection, highlight that state on displays in those respective areas with a running timer showing wait time. Or use FactoryWiz Monitoring to proactively reduce wait time by having the CNC operator flag first article parts before the machine is even done running so your QA department can begin to prepare gauges in advance and monitor each machine as it nears completion. FactoryWiz continues to expand in the US and Europe with new features that solve common challenges. One important feature often requested is a custom Machine Operator Tablet with standardized company look-and-feel. The new Flexible Tablet Interface allows customers to easily customize the Tablet Interface for their specific application. While all collected data is valuable, meaningful display data is subjective and different for almost everyone. The primary function of the Operator Tablet is for bidirectional exchange of information such as On Pace/Off Pace production status, light maintenance reminders, interaction with Quality Department and, most importantly, as a tool for operators to input downtime “why” reasons that are defined by management and displayed as large buttons for operators to easily access. Reasons for machines not in production can include critical information including No-Material, 1st Article Inspection, Program Change, Down for Maintenance, Etc. The automatic email feature is particularly useful for machines running unattended. Send an email (or SMS text message) when a machine enters a certain state for longer than a defined threshold. For example, if your EDM enters an alarm state while running a long job over the weekend, you can receive a message letting you know that the wire broke. Other popular uses include keeping track of machines running priority jobs or maintenance notification of pre-defined, serious alarms. In addition to the .NET DLL, most functionality is also offered via SOAP Web Service for access in a variety of other web architectures and programming systems, such as Java. Behind FactoryWiz lies your MySQL database which you can access directly for more powerful queries using any application aware of MySQL or which can take advantage of MySQL’s ODBC Connector functionality.